The diagram below describes the Sorting Door research test bed. 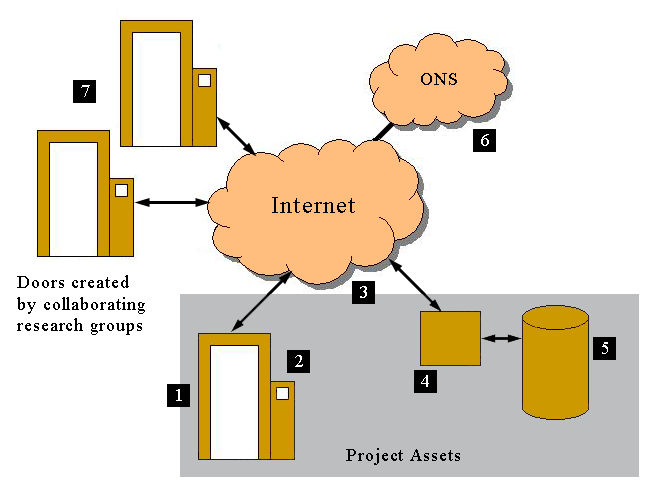 It consists of assets directly managed by the project, sources for information (in particular, commercial resources that will be made accessible by manufacturers, via the EPC Network), and Sorting Doors created by other parties, i.e., groups collaborating with the project and bringing their own resources to the table. 1. A Sorting Door; 2. Informational monitor; 3. The Internet is used as the project-wide transport network; 4. Inference engines and other tools; 5. Databases, both global and specific to various Doors; 6. The Object Name Service (ONS) and commercial sources for tag-related data, accessible via the EPC Network; 7. Other Doors, created by research groups and others collaborating with the project. The architecture supports any number of distinct “Sorting Doors,” which may or may not be constructed as doors, of course. This would allow for “franchising” the service to other academic institutions, research labs, etc., with benefits of reuse of various components, and the backend knowledge bases. The Internet is used as the generic network to link all doors with the back-end systems, so some form of message encryption/security would be employed. Doors both collect information, and (optionally) display it; display can be of raw information ("I just saw RFID = X go by") or interpreted information, ranging from RFID translation ("The RFID I saw is from a Donna Karan dress, color blue, size 0") to statistical ("I have seen this same RFID four times in the last week") to complex extrapolation ("Hello, Bianca! "), depending on configuration/request. The Doors themselves may perform some analysis, e.g., assessing whether some observed RFIDs ought to be considered as a “constellation” for purposes of establishing potential associations... Two RFIDs observed when a single person passes through the Door probably ought to be associated as a constellation, for example. Inference engines and other tools perform the work of developing longitudinal dossiers, and analysis of raw data to produce more informed results. They rely on a number of local databases, which could include various inferential rules (e.g., what various items might imply about their wearers/bearers), and also employ the Object Name Service (ONS) in performing RFID lookup for product information.